See the Expanded Study Guide at the end of this article for additional Reflection Questions and Exercises. Mary, the mother of Jesus, is esteemed in the Gospel of Luke as “most blessed among women” (1:42). We are accustomed to celebrating her memory and person in the solemnities and feasts dedicated to her. The months of May and October are considered months in which she is called to mind through our devotions as well as through the Liturgy of the Word. The 46 Masses dedicated to her are often celebrated on Saturdays when there is no special Mass dedicated to a saint (Collection of Masses of the Blessed Virgin Mary, Vols. 1 & 2. New York, NY: Catholic Publishing Co., 1992). In this reflection, we want to learn more about Mary as a disciple of Jesus and a woman of faith. Perhaps the following questions will help us meditate and reflect upon Mary, the faithful disciple of the Lord: How does Mary offer us an example of discipleship in the Gospels? What are the characteristics and criteria of discipleship given to us in the inspired words of the New Testament? 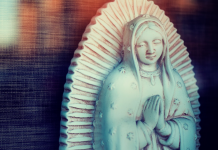 Is Mary able to be called the faithful and perfect disciple of the Lord? Our theological and scriptural reflection will be guided by the above three questions to see how Mary is a disciple of the Lord and how she meets the criteria for discipleship. The Gospels are our primary source for reflecting on and responding to these questions. Mary is mentioned in all Four Gospels and in the Acts of the Apostles. There is also a long tradition of seeing Mary and the Church in the symbolism of the woman clothed with the sun in the twelfth chapter of the Book of Revelation (Apocalypse). 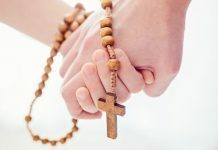 Even though the word disciple is never used directly in association with Mary in the Gospels, she is, according to the criteria for discipleship—and through a theological reflection upon the Marian texts of the New Testament—a faithful disciple of Jesus. In addition to her being called simply Mary, the mother of Jesus, virgin, and woman, we see Mary fulfilling the call to be a disciple. By reading the Scriptures in a holistic and contextual way, we certainly will be led to call her a disciple of Jesus. In turn, this will lead us to look at our own call from Jesus to be his disciples—not only after the example of the saintly Apostles and disciples of the past but also in our own circumstances today. The word disciple is almost exclusively used in the Gospels. Paul does not use it in his epistles nor is it found in the other writings except in the Acts of the Apostles. Luke calls to discipleship all believing Christians who are members in the emerging communities of faith and are dedicated to the person, words, and works of Jesus of Nazareth, the son of Mary. Because the word for “disciple” is found 261 times in the Gospels and Acts, we have sufficient textual evidence for discovering the key characteristics of discipleship. From this evidence we may be led to see Mary as the faithful disciple for our call to follow Jesus. The word for “follow” (akolouthein) is linked to the calling of a disciple. It means “a companion who goes behind a teacher or goes after the teacher.” The word indicating this following is disciple (mathetes from manthano: to learn, to be familiar with or accustomed to someone or something). Depending on the translation that is referenced, both words—following and disciple—are rarely found in the Old Testament; only one text shows use of the word disciple (see 1 Chronicles 25:8). 1. It is always Jesus who initiates the call to follow him and become his disciples (see cf. Mark 1:17; 2:14). 2. A disciple of Jesus is called to break totally from his or her past. This is compared to a seed falling into the ground and dying (see John 12:24). In Mark, we have the earliest reference to such a separation in the words of Jesus intimating that the one who does the will of God is mother, sister, and brother to him (see Mark 3:31-35; also Mark 1:17; Luke 14:26). Discipleship is a call to enter into the Paschal Mystery of Christ which we do at each Eucharist. 3. Our ordinary way of thinking and acting is changed into thinking the thoughts of God and Jesus. Some customary values are to be radically set aside in this following of Jesus (see Mark 10:41-45). The call makes demands of us, makes possible the break with our past, and gives us a new vision and future. 4. A disciple is a person who experiences life with Jesus and has a lifelong relationship to the very person of Jesus. 5. As a disciple of Jesus, one is sent out to witness to him, to become a “missionary” (apostoloi, apostellein), that is, to announce the Good News which is Jesus himself. 6. According to Luke, in Acts of the Apostles, all disciples are believing Christians who are sent out to bring Jesus and his message to everyone. Matthew, too, tells us: “Go, therefore, and make disciples of all the nations” (28:19). Discipleship becomes a universal call to holiness and witnessing to Jesus. 7. A personal relationship and experience of Jesus leads our discipleship into the intimacy that the Beloved Disciple had with Jesus and then with Mary. Phillip Mueller states: “The one who, like the Beloved Disciple, rests at Jesus’ side will receive a deeper view of reality and of the meaning of discipleship—wherever such a path may lead” (Theological Digest. Summer 2010, p. 157). Thus, discipleship is a prophetic call to be one with Jesus. Paul expresses it in this way: “For me to live is Christ” (Philippians 1:21). Having analyzed the criteria for being a disciple, we now turn to the Four Gospels and the Acts of the Apostles to see how Mary is a disciple of the Lord. Chronologically, we move from Mark to Matthew to Luke to John, then to the Acts of the Apostles. In the Gospel according to Mark, the cost of discipleship is seen in the passage where Jesus is sought out by his mother and his relatives (see Mark 3:31-35). Jesus has left his home in Nazareth and has begun his active ministry. In this passage, Mary will learn that the blood relationship she has as mother of Jesus is asked to be transformed into the same mission that Jesus has—which will have no ties to his natural family. Mary will have to accept this as his disciple who seeks, with him, to do the will of the Father. In Mark, Jesus has no father figure other than God working through him in his mission of teaching, preaching, and healing. His mother, brothers, and sisters are those who accept the call of discipleship because they, too, are called to do the will of the Father. Mary enters this mystery through her silence, which will lead her to experience the Paschal Mystery and the radical cost of discipleship that Mark’s theology requires. All who have faith in Jesus and follow his call will undergo what Jesus will experience in his sufferings, death, and Resurrection. The Infancy Narrative in the Gospel according to Matthew (chapters 1 and 2) presents Mary as virgin and mother respectively. Matthew points out the role of Joseph as the foster father and protector of Mary and her child (see Matthew 1:16-25; Matthew 2). 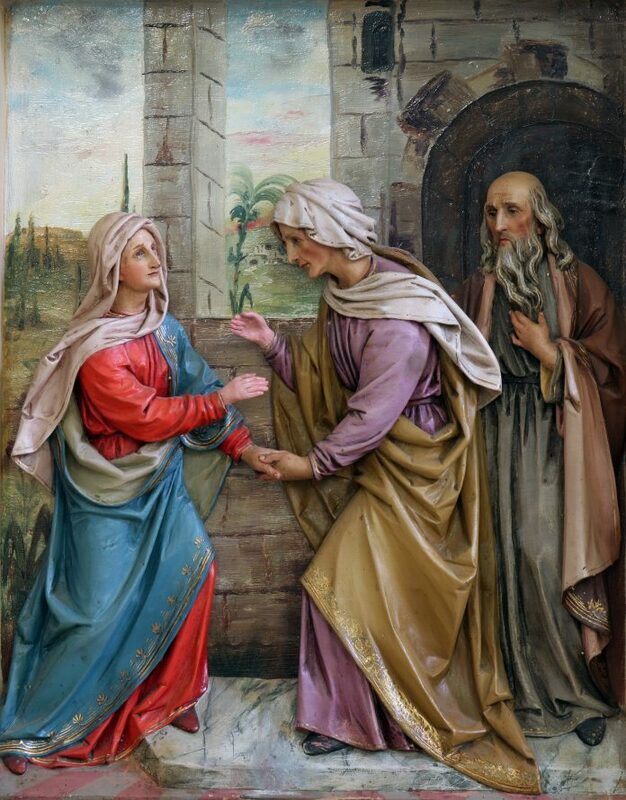 Matthew closely follows what Mark says about Mary but gives it a slightly different slant in the description of Mary and the brethren approaching him. Jesus is now teaching those surrounding him about discipleship. In Matthew’s Good News, we discover Mary as the only one who would be with Jesus through the stages of his conception, birth, and active ministry; and in his sufferings, death, and Resurrection. Jesus’ “silent years” are under Mary’s and Joseph’s tutelage and care. Jesus is trained in the work of a tekton (a builder, a carpenter) by Joseph, his legal father (see Matthew 1:18-25). Mary shows that her following of her son is a lifelong commitment to him—not only as mother but also as a faithful disciple. No one enjoyed the 30+ years with Jesus more than his mother Mary. It was a permanent, constant, and single-hearted commitment to Jesus through her virginity, her motherhood, and her discipleship. She exemplifies what Jesus teaches in the Beatitudes, and indeed is a blessed and happy person (makaria in Matthew 5:1-11). Without losing anything, Matthew builds upon what Mark teaches us about Mary and gives it a positive thrust. The Gospel according to Luke paints the most beautiful and complete portrait of Mary’s discipleship in the Annunciation (see Luke 1:26-38), where she is called by God and overshadowed by the Holy Spirit to be the virginal-mother disciple. In her visit to Elizabeth and in her song of praise called the Magnificat (see Luke 1:46-55), Mary is active in her role as disciple. She gives us the spirit of what a disciple is. We see Mary as radically reversing the standards of the temporal-order world into a perspective of social justice and peace. She does this through her strong commitment to her call and through her transparency and openness to her vocation. Mary participates in the history of salvation as a creative and active agent of discipleship. The Gospel according to John continues to develop the discipleship of Mary through what happens at Cana and at Calvary (see John 2:1-12; John 19:27-28). If the Beloved Disciple leaned upon the breast of Jesus, Jesus leaned upon the breast of Mary in his earliest years. The Beloved Disciple cannot be separated from Mary. He will take her into his intimacy (ta idia in John 19:27). She, like the Evangelist John and the mysterious person of the Beloved Disciple (John), is the guarantor of the content of the Gospel, which is the call to become and continue to the end as a faith-filled disciple. Mary does this while standing at the foot of the cross as Jesus severs his last bond with her and entrusts her to the intimate care and friendship with the Beloved Disciple, who is a model figure with her as the woman of faith. At Cana, Mary shows us her absolute commitment and trust in Jesus; at Calvary she stands there at the foot of the cross. She is with him in this last hour (his passion and death). “What is decisive is whether one devotes one’s entire person to following Jesus and remaining faithful to him. What is important is to surrender solely to Jesus. In the end, which path Jesus leads someone along is not important” (Mueller, Theological Digest. Summer 2010, p. 62). Faith and trust in the person of Jesus, the Word made flesh, is what Mary shows us at Cana (pisteuein eis Iesoun). At Calvary, love (agape) is what she shows us through her perseverance and intimacy in her relationship to Jesus as his first Beloved Disciple. In the Acts of the Apostles, Mary is seen for the last time in the New Testament. She once again waits for the coming of the Holy Spirit upon her and her new spiritual family gathered in the Upper Room. They are now experiencing the new birth of Jesus through the action of the Holy Spirit. Mary models for them how to respond to their call as his disciples. Luke will now be able to use the word disciple in reference to all who follow Jesus. Mary shows all of us the way that leads to this universal call in which we all share in her mission of bringing Jesus to others. She has given us the persuasive and graced command “to do whatever he tells you” (John 2:5). Lord Jesus, we gather in spirit at the foot of the cross with your mother and faithful disciple Mary, and with the Beloved Disciple whom you loved. We ask your pardon for our sins, which are the cause of your death. We thank you for remembering us in that hour of salvation, and for giving us Mary as our mother and our model in discipleship. Holy Virgin, take us under your protection and open us to the action of the Holy Spirit. Saint John, obtain for us the grace of taking Mary into our lives, as you did, and of assisting her in her mission. May the Father, the Son, and the Holy Spirit be glorified in all places through the Immaculate Virgin Mary. Father Bert was ordained in 1964. He holds an LSS in sacred Scripture from the Pontifical Biblical Institute and a doctorate in Marian theology from the Marianum in Rome. Father Bert is a professor at the International Marian Research Institute, Dayton, OH. He has published a three-volume work titled, Mary of Galilee; also With a Listening Heart: Reflections on the Psalms (Alba House). In the Congregation for the Doctrine of the Faith’s “Recommendations for the Year of Faith,” we read: “It will be helpful to invite the faithful to turn with particular devotion to Mary, model of the Church, who ‘shines forth to the whole community of the elect as the model of virtue’” (n. I.3). In his apostolic letter titled Porta fidei, Pope Benedict XVI wrote: “…we must not forget that in our cultural context, very many people, while not claiming to have the gift of faith, are nevertheless sincerely searching for the ultimate meaning and definitive truth of their lives and of the world. This search is an authentic ‘preamble’ to the faith, because it guides people onto the path that leads to the mystery of God” (n. 10). It is appropriate that we conclude our series by looking to Mary as a disciple and role model for seekers of faith. Father Buby, a renowned Catholic theologian on Mariology, beautifully guides us into a contemplation of Mary as a woman of faith. 3. Why do I think Mary is referred to as a disciple of Jesus? What theological grounds are there for attributing this title to Mary? 4. Reflecting on Fr. Buby’s insights on references to Mary in the Gospels and the Acts of the Apostles, what particular perspective do I learn about Mary’s discipleship? What images, words, or symbols emerge to describe how Mary is portrayed? 5. What are the seven characteristics and criteria for becoming a disciple? What does this look like in our contemporary reality today? What are the opportunities and challenges of twenty-first-century discipleship? 6. How do I think Mary can be the perfect exemplar for realizing the call of Pope Benedict XVI during this Year of Faith? 1. One of the best Marian websites is located at campus.udayton.edu/mary. Spend some time visiting the site and exploring the Gallery, Prayer Corner, and In the News. How might you apply these resources in a lesson plan? 2. Explore google.com for Mary-Mother of Jesus–Disciple. Identify links that compliment some of the ideas expressed by Fr. Buby. How might these be introduced into a catechetical learning environment? 3. Using the biblical references in Fr. Buby’s article, explore each of the Gospels for a more in-depth understanding of Mary’s presence in the life of Jesus and the first disciples. Invite your students to illustrate the life of Mary through various artistic media. These could be exhibited in the parish or school during May, Mary’s month. 4. Have students write poems or prayers addressing Mary as disciple and role model of faith for us today. Place these poems and prayers on the parish or school website during May or on special Marian feast days. 5. Introduce students to a variety of Marian prayers (see campus.udayton.edu/mary/maryprayers.html). Recommend to your students that they memorize one or more of these prayers as a means for nurturing Marian devotion. Discuss how memorizing prayers is important for cultivating our spiritual life and the life of our faith communities. Catechism of the Catholic Church. Washington, DC: USCCB Publishing, 1994 (usccb.org). Congregation for the Doctrine of the Faith: Recommendations for the Year of Faith (vatican.va). Disciples Called to Witness: The New Evangelization. Committee on Evangelization and Catechesis. Washington, DC: USCCB Publishing, 2012 (usccb.org). Porta Fidei (The Apostolic Letter for the Indiction of the Year of Faith). Benedict XVI. Vatican City, 2011 (vatican.va). United States Catholic Catechism for Adults. Washington, DC: USCCB Publishing, 2006 (usccb.org).